From arcades and miniature golf to museums and educational activities, there are plenty of options for family fun in the Oklahoma City metro area. Whether you're looking for a birthday party location or just a great way to spend the day with your kids, OKC has plenty to offer any time of year. From the famous Oklahoma City Zoo to Cactus Jack's Family Center, the top attractions in Oklahoma City for families offer everything from educational fun to thrilling games and rides. Each of these great attractions is within an hour of the Oklahoma City metropolitan area, which also includes Norman, Tuttle, and several other surrounding cities. Remember that when planning your family vacation to Oklahoma City, you should call ahead or visit each venue's website to confirm hours of operation, admission, and detailed information about parking, directions, and features of the venue. If you haven't been to the Oklahoma City Zoo in several years, you may not know what you're missing. It has changed for the better significantly since 2017, and the Cat Forest, Great EscAPE, elephant habitat, and aquatics shows are all top-notch. The little ones (under 3) get in free, but the others will only set you back a few bucks. Group rates are available, and the zoo has birthday packages as well. Not only are there some fantastic things to do at Orr Family Farm, the prices are quite affordable as well. You and your family can go fishing, ride the train, pet the animals, ride the carousel, play on the playground, sample the jams and jellies, or ride the pedal carts on the Orr Grand Prix. For birthday parties, holiday events, or just for a family night, Orr Family Farm is a great bargain for quality entertainment. Watching your child's eyes cross playing video games may make you long for some more worthwhile entertainment choices. Well, Science Museum Oklahoma has to be near the top of the list in that regard. At this museum, you'll see their eyes widen with wonder as they view and interact with the exhibits. You can grab a group and get some special discount rates or plan a Science Spectacular birthday party here as well. Along with Science Museum Oklahoma and the zoo, there are ways for kids to have fun while actually learning something. The Discovery Room at the Oklahoma Museum of Natural History is a hands-on gallery just for kids that allows them to interact with exhibits and uncover fossils in their own Dinosaur Dig. Located in the nearby city of Norman, the museum has programs for school classes as well as reservations for special events. For another hands-on experience, check out the Tiger Safari, an interactive exotic zoological park in the southwest town of Tuttle. This walk-through wildlife facility allows families to meet the animals on a guided tour, getting up close and personal with how they live. Tiger Safari also offers birthday parties and occasional special events, so there's no shortage of fun ways to enjoy this unique attraction. 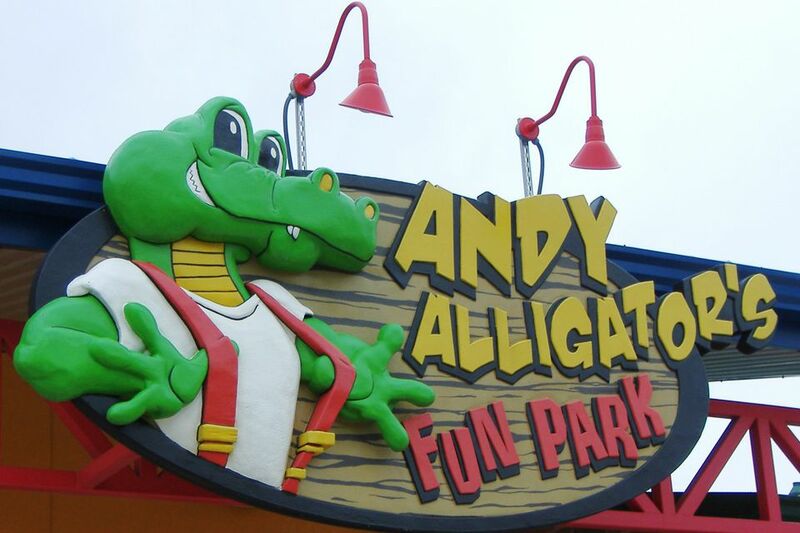 Andy Alligator's Fun Park in Norman is great for birthday parties, but it's also a fun way to spend the day with your kids any time of year. Children will have a blast with go-karts, mini-golf, bumper cars, or bumper boats, rock climbing, batting cages, bowling, and video games. The cafe has pizza and subs, and in 2012, they added a five-acre, $4.5 million water park that includes a 45-foot tall racer slide, a 400-foot tube slide, a long lazy river, water play structures, and a splash zone for the little kids. Located along Memorial Road, Oklahoma City's location of the popular chain Main Event features bowling, ropes course, video games, laser tag, billiards and fun food for kids. There's a full arcade, rock climbing wall, and special discount rates throughout the year. Adults will also enjoy the restaurant and adult game nights, so if you need a bit of a date night that's entertaining for both kids and adults, Main Event is a great place to go. Another Norman attraction that is great for kids is HeyDay, which features miniature golf, a huge laser tag arena, indoor ropes course, and many arcade games. In September 2014, a significant expansion also brought bowling as well as a lower Bricktown location next to Harkins. Prices are on par with those at Main Event, but both offer different daily discounts, so be sure to compare before you go. If you're looking for miniature golf, laser tag and arcade games, there's a spot right in the heart of Bricktown that offers all three. Visit Brickopolis along the canal for some excellent family fun. There's also a pizza buffet and a bar and grill, so you can enjoy a quick refreshment before continuing on your day of fun in Downtown OKC's Bricktown neighborhood. Depending on preference, going ice or roller skating is a great way to have fun while staying active, something kids don't seem to do enough these days. You can head to Arctic Edge Ice Arena in Edmond, Blazers Ice Centre in South OKC, and Southwestern Skate Center, each of which offers special birthday party options and daily discounts. Cactus Jack's Family Fun Center has been open since the 1970s, making it the oldest running arcade in Oklahoma. With plenty of new games to delight your kids and old favorites like pinball and foosball, you and your family are sure to enjoy a day at Cactus Jack's. Cactus Jack's does parties and after-hour rentals, and if you're a big spender, check out the VIP party option that includes a limousine. Celebration Station gets the kids outside for rides, minigolf, and more, and it has all the junk food favorites such as pizza, hot dogs, and hamburgers available for purchase. Save yourself some money, though, by checking out the package deals and specials ahead of time. In the summer, your kids will also enjoy bumper boats and a water play area. Chuck E. Cheese has a smaller atmosphere than a place like Celebration Station but may be better for the youngsters who can't play all the video games. This popular chain also features birthday packages that include the mascot mouse singing happy birthday to your child. With three locations near downtown Oklahoma City, Chuck E. Cheese is a great place to grab a slice of pizza and enjoy an afternoon of games.